The hoped for 200 entries for the competition have not yet arrived so if you were planning to send some, the expected cold dark evenings are the perfect excuse to get them emailed. The closing date is 30th November 2015. However, a keen photographer has been out taking pictures at Christchurch Park, Ipswich this weekend…. 11494 Firefly Cross and Ellis saloon – AOC Bulletin 520, November/December 2009, Page 77, article by Brian V Aket, Catching up with a long lost friend. In was in the Spring of this year when I received a letter from a lady in Somerset who I had never met or spoken to previously. In fact I didn’t even recognize the writing on the envelope which is quite unusual. The intrigue was settled when I sat down and read the letter. By asking questions at an ‘old car’ rally in her local area, she had discovered that I was the owner of an Alvis Firefly Six Light saloon, registration number PI 6714. It turned out that her father, who was a priest, had owned the car for many years, in the 50s, 60s and early 70s, and that she had many fond memories of the car, both as a childhood passenger and as a young driver. The letter asked all about the car and its more recent history. Fascinated by this unexpected correspondence, I replied immediately and sent her some very recent photographs of the car. It was not long before I had a response, both from Mary and also from Helen, her sister who also lives in Somerset. Both letters contained other interesting snippets of information about the car and more particularly about their father who died some years ago. 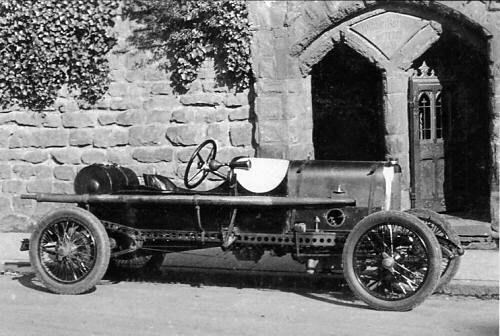 The car had previously been owned in Ireland by their grandfather who had passed it on to his son. It was also revealed that the family’s pet name for the car was’ Judy Ann’. Coupled with this information was a request to come to Suffolk to see the car and have a ride out. By mid August their plans came to fruition and they both made the long journey from Somerset to see the car. Having been well and truly spruced up for its big day, the car was gleaming as they arrived. There followed much pleasure and many reminiscences as they looked over and inspected the car. My favourite story was about the annual holiday from the Midlands to South Wales to stay with an aunt. Each year this seemed to happen and always with a bag of potatoes tied on to one wing and a bag of assorted vegetables strapped to the other. I must try it some- time! A ride out in the car and an opportunity for Mary to drive the car once again, interspersed with lunch, ensured a very happy occasion and one which was thoroughly enjoyable for all concerned. 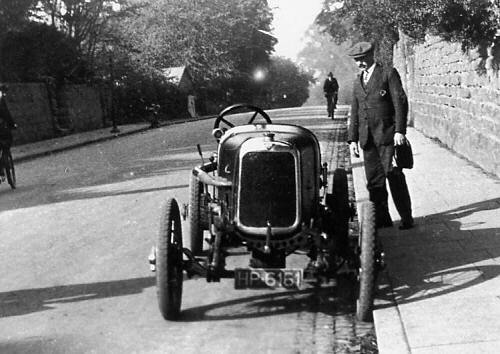 The vintage car is HP6161, Racing Car Number One photographed in a Coventry street in the 1920’s. Sorry don’t want to be picky but before the sharp eyed comment, thought I should say that the car numbers for PKV 166 have been transposed. Should be 25642. Many thanks to the photographer. Thank you Roger, duly amended. We like picky. The 1954 TC21/100 Greylady, chassis 25564 was acquired by me last April from New Zealand and its reg no was BM 8036 and was issued with a UK reg for the first time and has been enjoying its outings and making many friends with the EA section of the club.